Although I’m a bit squeamish about the severity of Haman’s demise, in my heart I am breathing a sigh of relief that justice has finally come. And I’m tempted to stay there. Rest in the small victory. Good overcame evil. I’ll stop there, thankyouverymuch. But this story of redemption is far from over. It Ain’t Over Yet. How many times have I done this in my own life, settled for the small win, instead of pushing through to final victory? Answer? A lot. Rather than pushing through, trusting God to see the mighty happen, I settle for the little win, and convince myself it is enough. I can think of many areas in which this is true….healthy eating, prayer, intercession for others, marriage, kids, I could go on. But as the dawn begins to break for Esther, as she sees the possibility of her people saved, she isn’t rejoicing yet. It Ain’t Over Yet. She still has work to do. God still has work to do. They aren’t finished. They are pushing on. God and His sovereign hand, though not even mentioned in these verses, is woven into the very fabric of this story, working things according to His plan. What a mighty God we serve! And in this moment, when we are feeling a bit uneasy about seeing justice come to Haman, we should ask the Lord to turn our eyes to One in a similar situation, though undeservedly. Our Lord Jesus Christ. And what was meant for evil by Satan, was really mighty triumph by Jesus Christ! And when He declared, “It is finished,” THAT is when it was finally over! 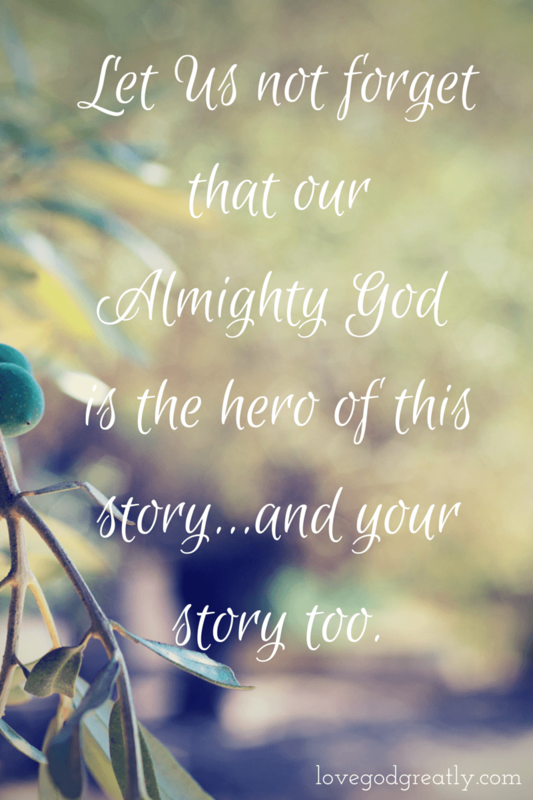 God, our God, the same God who was the hero in Esther’s story, is also the hero in ours. It may not seem like it, but God’s sovereign, loving hand is woven into every bit of our story too! And remember, It Ain’t Over Yet!! So, let’s chat: Where have you been tempted to settle for a small victory instead of trusting God for full redemption? How can knowing that “It Ain’t Over Yet” bring hope to your current situation? It ain’t over yet…I say that to myself every month. When I was in my twenties I was diagnosed with severe endometriosis. It left me with an ectopic pregnancy and childless for the past two decades. I’ve always believed God for a child/children, I still do. It may sound crazy, but even at age 46 (47 in just a few days) I still believe with God all things are possible. I believe He spoke it into my spirit when I was a young woman and I’ve tried not to get discouraged along the way. As a teacher I have many children who are a part of my daily life, and I love them all, but I still long for a child of my own. It ain’t over yet, I know, but some days it’s more difficult to remain in faith. Please pray for me. Your story really resonated with me and encouraged me this morning. I was diagnosed with severe endometriosis 6 years ago as well…and while it seems so much easier to just give up on having a child, I believe the Lord has spoken hope to me as well. Know that you are not alone. The Holy Spirit will continue to encourage and speak truth to us as we wait for victories. Reading your story was incredibly timely for me. I really needed to read that this morning. Thank you for sharing! Thank you for being brave and sharing your story as well. You have encouraged my heart and bolstered my faith today, sister. Praying for you today, sweet Stephanie. I love your heart, your faith, and your story. What a testimony to me today. Thank you for sharing your self with us. I am the better for it. You have brought tears to my eyes. Standing in prayer for you sister. Yes, and amen, it ain’t over yet dear girl. Loved loved the correlation between the wooden gallows and the cross! Beautiful! Me too Debbie. It brings tears to my eyes. Thanks for commenting! Thank you! I needed to be reminded of those words today. “It isn’t over yet”, Jesus has the victory! Thank you for your insightful essay. Very meaningful. April 29, 2013 God answered my prayer and blessed me with an awesome man who loved me & my daughter. God showed him in a dream i was his wife, talked about getting a house together etc. On Apil 9, 2014 it ended. You see because he was running from God made him run from us. Today’s devotional came at the right time, ive cried, fasted & prayed more then ive ever have before. I’m running on empty, & about to let go. However something keeps pushing me to stay the course, keep my faith believe that the impossible will become possible, a miracle, despite friends & family telling me to move on. God says He gives us the desires of our hearts. Im praying He will restore. Ladies who are authoring these posts…you have no idea the impact your writings and teachings on this book of Esther has impacted me and my 3 daughters. Sometimes, like many of these other commenters, life happens and we can’t see where God is in the midst of everything. But this story…has brought revelation and hope that is such a breath of fresh air. This is our 3rd year of homeschooling my daughters and the power that God has ushered in each morning with these readings and teachings through Esther has been so powerful for us. You have very eloquently caught the attention of a 16 year old, 12 year old and a 10 year old that I know God has great and mighty plans for. They have seen scripture come alive and be real in our everyday mess. We have had BIBLE STUDY by following all of your posts and Bible readings. So thank you. Thank you for being real and transparent. God is working through these mighty women of God that I am raising and one very humble mama! It aint over yet. I believe that! I am saying that in my life and continuing as I read these words today. I have triumphed in small victories and recently have had what seems to be another setback. Despite the natural outlook I am in belief that if we remain in faith and trust. God is there to fight on our behalf and being the victory to us. No matter what it appears to be if we trust in Jesus Christ He will guide us into all truth. Even with the confusion that has tried to seep in, God is bringing clarity and Victory!!! It’s Not over Yet! And me and my house shall see God glorified in our situations as others look on and have to praise Him also. Thank you Jesus!